Wo ist das nächste Atomkraftwerk? This Google Maps application lets you find the location of the nearest nuclear power plants to your home. When you first load the map your location is automatically detected and lines are drawn on the map from your location to the nearest nuclear power stations. If you click on any of the marked power stations on the map you can view its age and its distance from your home. The site is in German but even if you can't speak the language it is very easy to work out which of the figures is the age of the power station and which is the distance. The San Francisco BikeMapper uses Google Maps to provide biking directions using all existing Class I, II and III bike routes in San Francisco, southern Marin County and northern San Mateo County. Using the BikeMapper it is possible to find the best bike route for your trip with turn-by-turn directions. To get directions you just need to enter your starting point and destination. You can also select to get the shortest bike friendly route or, importantly for hilly San Francisco, the flattest bike friendly route. The results of your search are then displayed on the map and the turn-by-turn directions are listed in the map sidebar. Details of the route are also provided, such as the length of the journey, the estimated time and the carbon emissions saved. Have you ever wanted to spray your tag on the side of the White House or Buckingham Palace? At least you can virtually. Paint Your Street lets you add graffiti to Google Maps Street View. Anywhere that has Street View coverage can now be virtually daubed with your very own tag. Just log-in with your Facebook account, find your location on Google Maps and tag away to your heart's content. If you want to you can also browse other users' creations by most popular, most recent or just view your friends' artwork. Red Bull are using Google Maps and Google Street View to present a crowd-sourced map of street art from around the world. Using the map you can search for graffiti directly from the map and click on the map markers to view a Street View image of the art. The site includes quick links to the 'most viewed' and the 'latest additions' to the map. There are also quick links to works by popular graffiti artists such as Banksy and Keith Haring. 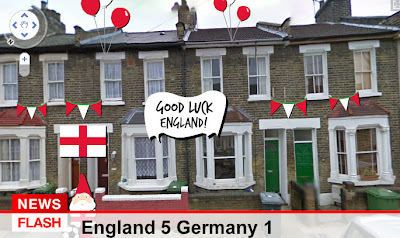 UK housing charity, Shelter produced a special World Cup edition of their Christmas Street View House Decoration application last year. The World Cup may have finished a long time ago but the application is still working. This Swedish language Google Map provides advice and tips about the favourite tourist destinations of the Swedish around the world. As well as providing travel tips from Mattias Varén the map also shows tips sent in by users. The yellow markers on the map indicate tips provided by Mattias and the green markers are those sent in by users of the map. It is possible to filter the travel tips shown on the map by country and by type of holiday destination. The categories include, Family Travel, Weekend, Backpacking, Cruises and Adventure. One of the most popular uses of the Google Maps API since it was launched six years ago has been as a tool to view historical maps. The David Rumsey Collection, with its huge collection of historical maps, obviously stands out. However it does not stand alone. The David Rumsey Google Map Collection contains an amazing 120 historical maps overlaid on Google Maps. 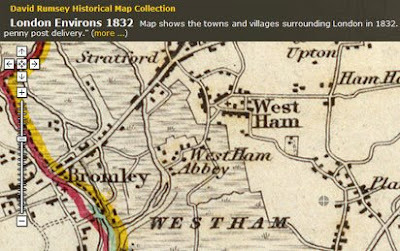 For, example, the screen shot above shows an 1832 map of London overlaid on the current Google Map of London. Highlights of the new maps include the first accurate survey of Yosemite Valley, California, from 1883, maps of Los Angeles, San Francisco, Seattle, New York, Washington DC, Denver, Chicago, Moscow, St. Petersburg, Calcutta, Lima, Paris, Madrid, Rome, Beijing, Tokyo, Kyoto, and more – all from times ranging from the 18th to the 20th centuries. 4sqmap lets you view your foursquare check-ins on a Google Map and access all your other foursquare statistics. As well as viewing all the locations you have checked-in you can view all the places where you have earned badges and where you have become the mayor. You can also view the latest check-ins made by your foursquare friends. The map also allows you to search for the currently trending venues, search for recommended place nearby and search for local venues that are currently running foursquare deals or offers. Here is a handy application if you need to get zip codes around a particular location. Using the application you can enter an address or zip code and a radius size and view the location and all the surrounding zip codes within the given radius on a Google Map. The returned zip codes are also displayed in the map sidebar. If you mouse-over a listed zip code in the sidebar it is highlighted on the map. The 2011 Spanish electoral results in the context of historical electoral results and a vast range of demographic indicators. Using the map you can view electoral results since 1987 and discover how the electoral and socio-economic landscape of Spain has evolved over the last few decades. TU Delft Clouvdviewer allows for the 3D exploration of massive point clouds directly from a web browser. The Cloudviewer lets you explore Delft in the Netherlands in 3D, from a number of angles and points of view. An excellent Google Map of Grand Theft Auto IV. Walk around the whole of Liberty City in Street View. I think this might just be one of the most awesome things I've seen ever. This Google Map lets you explore the whole of Liberty City, from Grand Theft Auto IV, in Street View. GTA4.net have created custom Street Views of the whole of Liberty City and added them to this Google Map. The map shows all the important locations in the game, such as health & weapon pick-up points and all the important mission starting points. However, once you enter Street View, you will forget about all that and just spend all your time wandering the streets of Liberty City through the amazing custom Street Views of the game. The Street View option in this Liberty City map works just as it does on Google Maps. Drop the pegman icon anywhere on the map and you can start exploring the game in Street View. You can click on the arrows to navigate around the city and you can use the mini inset map to keep track of your position in the city. I can't begin to think how many hours went into capturing the imagery for these custom Street Views and then lovingly mapping it all with the Google Maps API. Just ... wow! This Google Map demonstrates the advantages of using HTML5 canvas to create an overlay for a map. What impresses me most about the map is how fast the canvas element is drawn on the map. There are a few thousand polygons on this map and they load seamlessly. If you zoom in and out on the map you can really appreciate the speed with which the polygons are displayed. I think the overlay shows US monthly employment rates. GetFlight is a Google Maps based application that displays the cheapest flights in and out of Australia. The application tracks sale fares for the four major domestic carriers and some of the largest international airlines that operate in and out of the country and displays them on a map. To start you can just click on one of the major cities and the cheapest domestic and international flights are immediately shown on the map. It is also possible to type in your starting point and your destination of choice to see the best deals for that journey. If you select the 'search direct' button you can also define the dates you wish to travel and select which airlines you wish to fly with. Maps+ is an iPhone and iPad Google Maps application from IZE that improves on the default iOS maps app with a few new useful features. Maps+ lets you record and edit GPS tracks. With a tap of a button you can start recording your location. When you are finished recording you can edit the track by deleting individual waypoints or by trimming the beginning or the end of the track. Maps+ also allows you to set location based alarms. You can set an alarm at a location, for example for a specific train station when you are on a train, and get a reminder when you reach that location. The application also acts as a Twitter client. You can use this option to view Tweets around your current location live on a Google Map. If you are scared of heights then you might want to try this Google Maps version of skydiving instead of dropping out of a plane at 10,000 feet. Street View Funny wonders if the Google Street View car driver might have found himself a nice sideline in wedding photography after discovering this Street View image in Hong Kong. After a busy day posing as a wedding photographer there is nothing the Street View driver enjoys more than a cruise around Tokyo Bay. Shy Breaker wants to help you overcome your normal reticence and meet other people through the Shy Breaker desktop and iPhone application. Using Shy Breaker users can drop a note on a Google Map. The note can be about someone you've spotted and would like to meet or it could just be a note to say you would like to meet other like minded individuals. Users can time-stamp their notes so that they only appear on the map for a specified period of time. Travel planning website Tixik has created a nice and simple to use Google Maps based trip planner. To create a map for your trip with Tixik all you need to do is type in the destinations that you are planning to visit into a plain text box. If there are any duplications in the database that match your chosen location you can select the correct one from a drop-down menu. A map of your tip is then created, with map markers displaying all your chosen destinations. Tixik also creates the embed code for you to add the created map to your own website or blog. After coupon based sites the big new trend in location this year seems to be localised question and answer platforms. Gootip is an application, available on iPhones and Android phones and from your desktop, that lets you ask a question about a location and receive answers from the crowd. You can use Gootip to ask any kind of question linked to a city or a specific place, for example, "Where can I see a hip hop concert tonight in New York?" or "Who is the best doctor in the Mission District in San Francisco?" Other users of Gootip will then respond to your question. The answers you get back will be sorted by the respondent's location, information provided when they registered and their expertise level through 'stickers' earned by answering other questions. Crowdbeacon -ask location based questions of the crowd. Today the ash cloud from the Grimsvötn volcano continues to drift across Europe, causing the closure of a number of airports in northern Germany. This Google Map shows the current position of the ash cloud. The map creator is updating the position of the cloud every six hours. The map also shows the position of Grimsvötn in Iceland. Flightradar24 - this Google Map shows the position of the ash cloud and the real-time position of planes in European airspace. ChargeMap can show you the location of charging stations for electric cars in France. The application is available for iPhones, Android and from the desktop. If you enter your current location into the desktop application ChargeMap will show you the nearest charging stations on a Google Map. Your location is shown by a red marker on the map and the charge stations are indicated by blue markers. Each charge station includes information about the distance from your current location, the number of charge points available and its exact address. The TU Delft Cloudviewer is the first application to allow 3D exploration of massive point clouds directly from a web browser. The Cloudviewer lets you explore Delft in the Netherlands in 3D, from a number of angles and points of view. The TU Delft Cloudviewer was developed as a final student project for the Minor 3D Virtual Earth. As part of the project aerial photography and 3D point clouds were pre-processed for use in a real-time 3D rendering engine. Then students designed a system to simulate a virtual camera that creates tens of thousands of oblique 'birds-eye' snapshots for various zoom-levels and viewing angles. These resulting images are then shown in the Cloudviewer as a layer in Google Maps. Using Google Maps you can explore the 3D point clouds from a number of different perspectives. There are three oblique views available, from 90, 45 and 20 degrees. It is also possible to rotate the point clouds to view the resulting images from north, south, east and west. Vizzuality have a history of producing some of the most interesting and beautiful Google Maps applications. Their latest effort for the Spanish broadcaster RTVE is up their with the best of them. The map presents the 2011 Spanish electoral results in the context of historical electoral results and a vast range of demographic indicators. Using the map you can view electoral results since 1987 and discover how the electoral and socio-economic landscape of Spain has evolved over the last few decades. The map allows you to visualise 15 datasets at 3 different administrative levels over more than 20 years. All the data is visualised on the map using colour coded custom tiles and the result is a great looking map that presents a huge amount of data via a user friendly interface. MapLabel is a very nice utility library for the Google Maps API that allows you to add labels to Google Maps. Labels created with the utility are dynamically rendered on Google Maps using Canvas 2D. Developers can define the font size, the font face, color and alignment of the labels. I've created a demo of the library in action here, which (at the risk of seeming obsessive) places labels on a map of the 2012 London Olympics site. One really useful feature in the library is the maxZoom and minZoom controls. These let you define at what zoom levels labels should be visible. In my example map above if you zoom in on the Westfield Shopping Mall the 'Westfield Shopping Mall' label disappears and a number of other labels become visible, showing the locations of individual stores. If you want to know more check out the reference documents and the source code. Sparkrelief: Housing is a Google Maps based system for offering and finding shelter in times of emergency. Due to the recent tornadoes in America and the earthquakes in Japan images of displaced people seem to be never far from our television screens. Sparkrelief have created this Google Map so that people can offer spare rooms in their houses to those who have lost their homes because of natural disasters. It is possible to search the map by relief efforts. For example, at the moment you can search the map by the 'Alberta wildfire', the Mississippi flood, the Alabama tornadoes, the Texas wildfire and the Japanese earthquakes. It is also possible to search the map for available shelter by location and the number of people needing shelter. If you wish to offer your rooms in your house as shelter you can do so by completing a short form. I strongly suspect that when the Olympics Park for the 2012 London Olympics opens next year the Google Street View trike will be one of the first visitors. However at the moment there is no Street View available for the site of next year's Olympics. I therefore decided today to create my own Street View map of the Olympics construction site in east London. I have to apologise for the poor quality of the photography. I created the Street View panoramas for this map using a free Android app from 360 VTcreator, which, whilst it is a brilliant free app, doesn't really create photographs of a high enough definition for Street View. I advise you not to zoom in! The opportunity for space tourism is probably still a little way off for most of us. Whilst we all wait for Richard Branson to make space travel a lot more affordable we will have to make do with this Google Map showing the current location of the International Space Station on Google Maps. The map shows the current view from the ISS looking down at the Earth. So you can fire up this map and pretend that you are a space station astronaut watching the Earth spin beautifully beneath you. If your imagination needs a little more help then you should also check out NASA Astronaut Ron Garan's photo stream on Twitpic. Garan is currently posting photos from the space shuttle Endeavour and the International Space Station. This year there has been a spurt of English language websites using Google Maps to show you nearby shops and restaurants offering daily deals and coupons. Coupon sites are also proving very popular in France. Ohmydeals is a French website for daily deals and coupons. Ohmydeals uses Google Map to allow users to find their nearest deals. It is possible to search the map by location and by category of deal. The categories include 'restaurants and bars', health and beauty', 'sport' and 'travel'. As well as searching for deals by Google Map it is possible to receive deals via Twitter, Facebook and mobile phone. Plyce is another French website that delivers daily deals and coupons. Again Plyce lets you search for the latest deals by location and by category. If you share your location with Plyce you can then search for the nearest deals in a number of categories, including 'restaurants', 'technology', 'fashion' and many more. Once you select your location and category the deals are displayed in list form. When you select a deal Plyce shows you the location of the selected shop / restaurant on a Google Map. Microformats.dk has created a couple of interactive image maps from two spectacular photos of the space shuttle Endeavour. The two images are Endeavour Passing Over the Rhine and Endeavour Docking with the International Space Station. The maps were created with the CASA Image Cutter. The Copenhagen Marathon is running at this very moment. A number of the runners are carrying GPS units and you can follow them live on this Google Map from Endomondo. The map includes a plan of the route of the marathon. Profile pictures of the runners display their current location on the course. If you mouse-over any of the profile pictures you can view the distance covered by the runner and their current time for the race. Invisible Playground was definitely the most retweeted map on Google Maps Mania this week. Using the Google Maps satellite view as a background image certainly seemed to catch a lot of people's imagination. When you drag the map around the map also moves for everyone else viewing the webpage. What's more every move of the map is recorded and Invisible Playground plan to post a map soon tracking where user's have dragged the map. Smells Like Teen Spirit is going down a storm in Russia this week with over a thousand fans on Last.fm. Whilst in the USA over 7,000 listeners are Rolling in the Deep with Adele. Global Billboard visualises the popularity of top artists and top tracks on Last.fm in (nearly) every country in the world, and in more than 200 metro areas. Using the map it is possible to check out which are the most listened to artists and tracks on Last.fm in different countries. Are you struggling for something to do in New York this weekend? Then you should consult The Weekend Map, your guide to everything happening in the Big Apple at the weekends. The Weekend Map displays events happening in New York from Friday through to Sunday, on a Google Map. The listed events on the map are categorised into festivals, music eating, farmers markets etc. It is also possible to filter the events by day. MapMyFriends lets you view all your Facebook friends on a Google Map. To create a map of your Facebook friends all you need to do is sign in to the map with your Facebook account and your friend map is created automatically. The map uses the Facebook profile pictures of your friends to indicate their location. If you click on any of the mapped profile pictures you can click through to visit that friend's Facebook profile. This Facebook application also maps all of your Facebook friends and, in addition, extracts other interesting facts from your friends' profiles. On installing this application to Facebook you are presented with a Google Map displaying your friends' locations indicated by their profile picture. Under the map there is a series of tables informing you about how many of your friends are male or female, how many are single or in a relationship and how many of your friends are conservative and how many are liberal etc. The application gives you a good overview of the geography of your Facebook network, as well as an insight into its political, religious and relationship leanings. Where My Friends Be is a nice Google Maps app to visualise the locations of all your Facebook friends. To create a map you just need to connect your Facebook account and in a matter of seconds you are presented with a Google Map showing the geographical distribution of your social network. Friends Density is another nice way to visualise the geographical distribution of your Facebook friends, this time in the form of a heatmap. Once you sign up to the app in Facebook you can view your friends on a Google Map. You can even read your friends' latest status updates directly from the map. What do you do if Google Maps hasn't got Street View imagery for your neighbourhood and has also announced that they will no longer be collecting new Street View data in your country? If you are Jan Martin the answer is easy - you go out and shoot your own panoramic images. You then use the Custom Street View function of the Google Maps API and you create your own Street View map. Jan has taken a number of panoramic panoramas around his home town of Langen and has used Google Maps to provide a virtual tour. Jan's map works almost exactly the same as Google Maps. The blue lines on the map show where custom Street View imagery is available. If you click on a blue line (don't drag the pegman icon) you can enter the Street View. iNaturalist is an online community for nature lovers. Members of iNaturalist can use the community to record what they see in nature, meet other nature lovers, and learn about the natural world. The iNaturalist Google Map lets users submit their observations and browse the reports of other nature lovers. The map uses categorised markers to indicate if a report is about a plant, bird or animal etc. Observations can include comments and photographs. Each submitted report is given a dedicated page with details and photographs of the observation and with space for readers to leave comments (particularly useful if you need help in identifying something). MyStreet is a UK project where anyone can make a short video about the street they live in. The result is a really interesting snapshot into life in the UK and what people think is important about their neighbourhoods. The site features a Google Map of all the films submitted so far. If you click on any of the map markers you can watch the film about the location and view a brief description. If you want to take part submit your video before May 26th and you will also be eligible for the 2011 Open City, London Documentary festival. Map Channels Hotels lets you search for and book hotel rooms worldwide. Using Map Channels Hotels it is possible to search for a hotel by location, price and date. After you have entered your search criteria the results are displayed on a Google Map. The price of each hotel room is shown directly on the map so it is very easy to see at a glance the available options. If you click on a marker then photos and details of the hotel are displayed in the map sidebar. Map Channels has also created this Google Map that lets you search and book tickets for events worldwide. Mashed Tickets lets you search for events by location, venue, performer / artist or by event name. The results of the search are then displayed on a Google Map. If you click on one of the displayed venues you can view the upcoming events and clcik through to book your tickets.